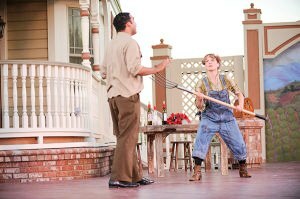 Jennifer had a magnificent time playing Katherine Minola in The Taming of the Shrew at Livermore Shakespeare Festival, directed by Gary Armagnac. The play was set in 1945, at the end of World War II and was such fun. McClain and Le Blanc bring to their portrayals an appealing balance of roguish decency. This entry was posted in Acting, Articles, Play. Bookmark the permalink.